12 www.coalage.com November 2018 news continued c a l e n d a r o f e v e n t s ment will provide a cushion for First Energy Solutions to stabilize the oper- ation," Gov. Justice said. "I am hopeful that over the next three and a half years, a permanent fix for the long-term opera- tion of the facility will be reached so that it remains a vital part of America's power grid. I am encouraged that the men and women who work at this plant will be there producing power for our country for decades to come." The approval of the settlement agree- ment moves FirstEnergy closer to its goal of exiting the competitive, deregulated generation market and moving into the regulated market, which it announced in November 2016. Parties to the September-approved settlement include FirstEnergy, FES, the Ad Hoc Noteholders Group, the Bruce Mansfield Certificate Holders Group, and the Unsecured Creditors Committee. Un- der the agreement, FirstEnergy will make a settlement payment of $225 million to FES and issue $629 million in notes that would mature in December 2022. The entities also agreed that FES will take on ownership of the two-unit 1,300-MW Pleasants Power Station from FirstEnergy subsidiary Allegheny Energy Supply (AES). AES will continue to operate the plant until the transfer is complete. Logistics Impact Rhino Resources Despite the ongoing robust coal market de- mand, Rhino Resources experienced delays in rail service late in the third quarter due to weather conditions that temporarily closed east coast export terminals. The company incurred substantial demurrage costs from shipments that were delayed due to previ- ous rail constraints from weather condi- tions experienced earlier in the year. The Pennyrile operation experienced adverse geological conditions and the mining areas have been adjusted to improve future pro- duction. Mining costs increased at Castle Valley as the operations transitioned to an adjacent coal seam. "During the current quarter, we expe- rienced modest improvements in rail ser- vice, which contributed to increased sales particularly for our export coal orders," said Rick Boone, president and CEO of Rhino Resources. "On the cost side, we ex- perienced an escalation of steel prices that increased our roof support costs as well as increases in fuel pricing, both of which af- fected our margins." In to 2019, Boone said coal prices have improved for met and thermal coal. "We have more than 85% of our 2019 coal production contracted at prices ex- ceeding our 2018 benchmark," he added. 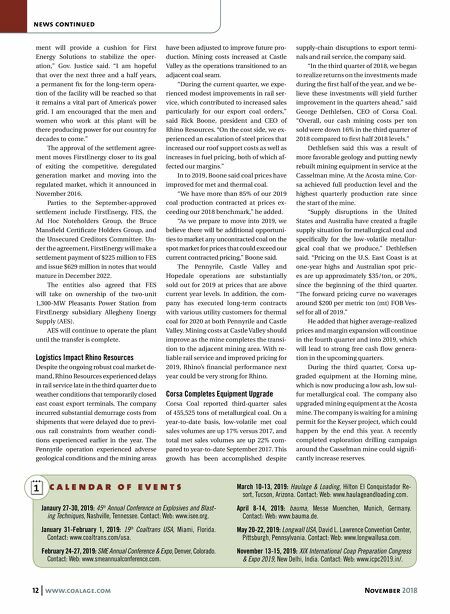 "As we prepare to move into 2019, we believe there will be additional opportuni- ties to market any uncontracted coal on the spot market for prices that could exceed our current contracted pricing," Boone said. The Pennyrile, Castle Valley and Hopedale operations are substantially sold out for 2019 at prices that are above current year levels. In addition, the com- pany has executed long-term contracts with various utility customers for thermal coal for 2020 at both Pennyrile and Castle Valley. Mining costs at Castle Valley should improve as the mine completes the transi- tion to the adjacent mining area. With re- liable rail service and improved pricing for 2019, Rhino's financial performance next year could be very strong for Rhino. Corsa Completes Equipment Upgrade Corsa Coal reported third-quarter sales of 455,525 tons of metallurgical coal. On a year-to-date basis, low-volatile met coal sales volumes are up 17% versus 2017, and total met sales volumes are up 22% com- pared to year-to-date September 2017. This growth has been accomplished despite supply-chain disruptions to export termi- nals and rail service, the company said. "In the third quarter of 2018, we began to realize returns on the investments made during the first half of the year, and we be- lieve these investments will yield further improvement in the quarters ahead," said George Dethlefsen, CEO of Corsa Coal. "Overall, our cash mining costs per ton sold were down 16% in the third quarter of 2018 compared to first half 2018 levels." Dethlefsen said this was a result of more favorable geology and putting newly rebuilt mining equipment in service at the Casselman mine. At the Acosta mine, Cor- sa achieved full production level and the highest quarterly production rate since the start of the mine. "Supply disruptions in the United States and Australia have created a fragile supply situation for metallurgical coal and specifically for the low-volatile metallur- gical coal that we produce," Dethlefsen said. "Pricing on the U.S. East Coast is at one-year highs and Australian spot pric- es are up approximately $35/ton, or 20%, since the beginning of the third quarter. "The forward pricing curve no waverages around $200 per metric ton (mt) FOB Ves- sel for all of 2019." He added that higher average-realized prices and margin expansion will continue in the fourth quarter and into 2019, which will lead to strong free cash flow genera- tion in the upcoming quarters. During the third quarter, Corsa up- graded equipment at the Horning mine, which is now producing a low ash, low sul- fur metallurgical coal. The company also upgraded mining equipment at the Acosta mine. The company is waiting for a mining permit for the Keyser project, which could happen by the end this year. A recently completed exploration drilling campaign around the Casselman mine could signifi- cantly increase reserves. Janaury 27-30, 2019: 45 th Annual Conference on Explosives and Blast- ing Techniques, Nashville, Tennessee. Contact: Web: www.isee.org. January 31-February 1, 2019: 19 th Coaltrans USA, Miami, Florida. Contact: www.coaltrans.com/usa. February 24-27, 2019: SME Annual Conference & Expo, Denver, Colorado. Contact: Web: www.smeannualconference.com. 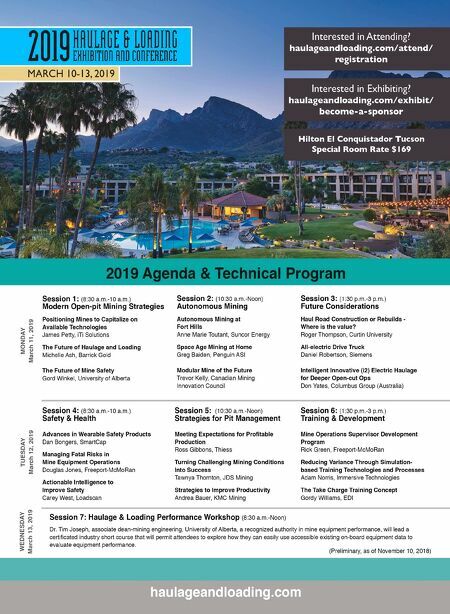 March 10-13, 2019: Haulage & Loading, Hilton El Conquistador Re- sort, Tucson, Arizona. Contact: Web: www.haulageandloading.com. April 8-14, 2019: bauma, Messe Muenchen, Munich, Germany. Contact: Web: www.bauma.de. May 20-22, 2019: Longwall USA, David L. Lawrence Convention Center, Pittsburgh, Pennsylvania. Contact: Web: www.longwallusa.com. November 13-15, 2019: XIX International Coap Preparation Congress & Expo 2019, New Delhi, India. Contact: Web: www.icpc2019.in/.